One of the grand and magnificent landmarks of Mumbai, the Gateway of India was built to commemorate the visit of the British Monarch, King George V and Queen Mary. 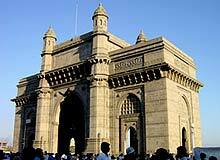 The Gateway of India is one of the hot spots of Mumbai city. The Gateway of India is a massive archway on the Apollo Bunder. For most of the tourists and travelers, the Gateway of India is the starting point to explore the Mumbai city. The Gateway of India was designed by the architect George Wittet. The first stone of the Gateway of India was laid on March 31st 1913. The foundations were completed in 1920 and the Gateway of India was formally opened in 1924 by the then Viceroy, Earl of Reading. Built in the Indo-Saracenic style, the Gateway of India is a 26m high structure with four turrets and complicated lattice work engraved into the yellow Kharodi basalt stone. The central dome of the Gateway of India is 48 feet in diameter. It is interesting to note that the whole harbor front was realigned in order to come in line with a planned walkway, sweeping down to the centre of the town. The total cost of construction of the Gateway was approx. Rs. 21 lakhs. The Gateway of India is a major sightseeing hangout in Mumbai. At the back of the Gateway arch, steps lead down to the sea front. From here one can enjoy cruise through Mumbai's fabulous natural harbor. The nearby statues of Shivaji and Swami Vivekananda add charm to the massive structure, the Gateway of India.